Many feel that American Kobe beef is just as good as the original Kobe beef, which comes from Japan. Kobe beef is an ultra-premium beef that comes from the region surrounding Kobe, Japan. For centuries, the Wagyu cattle were used for rice cultivation, however, in recent times the cattle have been cultivated as a source of beef. Kobe beef is loaded with delicious fats that melt into the meat as it cooks, spreading unbelievable flavor throughout. The remaining fats melt like butter in your mouth, resulting in a richness of texture that is unsurpassed. According to legend, Japanese Kobe Beef is massaged with sake wine, fed beer and raised listening to soft music. It is said that this is the secret to perfect Japanese Kobe beef. The American version of Kobe beef comes from the same Wagyu cattle as the original. American ranchers, however, take a less esoteric approach to developing meat with sublime flavor. Instead, American Wagyu ranchers believe that selective genetics and careful feeding are the key ingredients to developing ultra-premium beef. American Kobe beef ranching began in the 1990s, when the Wagyu cattle began arriving from Japan. Much of the production of American Kobe beef takes place in the mid-west, primarily Wisconsin. 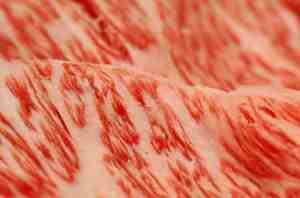 The Wagyu are fattened for much longer than American beef cattle, about 26 to 32 months. American beef cattle are typically fattened for only 18 months. The beef that comes from the American Wagyu cattle is considered to be better than prime, which is the highest grade provided for beef by the US Department of Agriculture. A Prime designation means that the beef is well-marbled with fat. The good news about Kobe beef from America is that it is considered healthier than traditional American beef. It has higher levels of unsaturated fat, and high levels of oleic acid, which is the fatty acid found in olive oil. that has been found to lower LDL cholesterol. Another health feature is that Wagyu cattle is usually hormone-free and antibiotic-free. The bad news about the beef produced from the American Wagyu cattle is that it is breathtakingly expensive. Two sixteen ounce rib-eyes, for instance, can cost more than $100. In a restaurant or steak house, that may be the price of a single serving of the beef. Kobe beef is much more filling than American beef, however. The high fat levels in the beef as well as its richness quickly satiate even the hungriest diner, so a typical serving of Kobe beef is three to four ounces - a far cry from the eight to sixteen ounce serving sizes you will see of traditional American beef. Much like there are a variety of cuts of traditional American beef, so there are a variety of cuts from American Wagyu cattle. Kobe beef from America comes in all steak cuts - from sirloin all the way up to Porterhouse or tenderloin. Four eight-ounce tenderloins will cost in the neighborhood of $225. Roasts are also available. A six to seven pound prime rib roast costs in the neighborhood of $250, while a two pound tenderloin roast comes in at around $190. Ground beef is also available at the reasonable price of $8 to $10 a pound. When you are shopping for Kobe beef, keep in mind that although all Kobe beef from America is Wagyu beef, not all Wagyu beef is Kobe beef. If you come across beef in the supermarket labeled Wagyu beef, it is most likely not Kobe beef, but an inferior cut such as a braising cut of beef. In premium cuts such as rib-eye steaks, the fat marbling makes a huge difference in flavor; however, in the braising cuts of beef (such as a London broil or chuck roast), as well as in ground meats and sausages, there appears to be little difference in the flavor of the beef used. Since Wagyu braising cuts are sold at nearly double the price of traditionally raised braising cuts, you would be better off saving your money and going for the traditional-and far less expensive-beef. Kobe beef is delicious served American-style, with a delicious salad, a side of marinated mushrooms and a glass of red wine. The only seasoning it needs is a little sea salt and fresh cracked black pepper. Kobe beef from America is as high quality and delicious as Japanese Kobe beef. The next time you are in a steak house and you see it on the menu, if you are feeling flush you might want to delight your taste buds and give it a try.